Festivals of the LORD reveal Bible Prophecy about End Times. | The History of Hanukkah Foreshadows the Reign of Antichrist! | Asteroids in Bible Prophecy Reveal End Times and the Rapture | Why is it so Important to Study "Bible Prophecy"? | Bible Study rule #1: Study Bible prophecy in proper context! | Resurrection and the Rapture | Interpreting "Revelation" | The Day of Trumpets: The 7th Trumpet or Last Trumpet Sounds! | End Times Prophecy Must Be Studied with a "Hebraic-Mind Set" | Before Wheat is Gathered into the Barn, it Must be Threshed! | Who Are the Twenty-Four Elders of Revelation? | To Him Who Overcomes | Can Jesus Christ return at any moment to rapture the church? | Is there Evidence that Proves the Bible is Divinely Inspired? | Blasphemy of the Holy Spirit and The Day of Atonement | Sit at My Right Hand Until I Make Your Enemies a Footstool! | The seventh day is a Sabbath to the LORD, assembly and rest | Gideon - A Prophetic Picture | The Prayer of Jabez | 1,000 Year Renewal of the Garden of Eden | Missing Bees, Cell Phones and Fulfillment of Bible Prophecy! | Those Who Were Sealed:144,000 from All the Tribes of Israel | All of Creation Bears the Image and Likeness of Our Creator! | The joy of the LORD is our strength, how can we know His joy? | Messianic prophecies fulfilled by Messiah Yeshua (Jesus Christ) | Christ Who Was Born King of the Jews is Both Savior and Lord. | What Do Jews Believe About Hell? | The Messiah is the Son of David | Until the Rebellion Occurs | Who Is Mystery Babylon The Great Mother of Prostitutes? | DO YOU KNOW? | Now I Know | Sharing the Gospel with a Rabbinical Student | Fasting and Prayer: Spiritual Power to Set the Oppressed Free | Just Pray No! 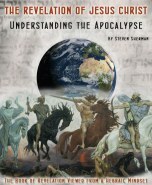 Ltd. "Weekend of Prayer" | The Testimony of Author Steven L. Sherman | THE REVELATION OF JESUS CHRIST: Understanding the Apocalypse | Christianity versus Cults and Counterfeits - Defining Cults | Church of the Latter-Day Saints, Joseph Smith & the Mormons | Is Catholicism True Orthodox Christianity or a Christian Cult? | Is this the Dawn of a New Age or just Old Fashioned Paganism? | Is Seventh-Day Adventism Christianity or is SDA Cultism? | Islam: The Religion of "Peace" Bent on Conquest | The Claims of Freemasons vs. the Hidden Truth of Freemasonry | The Jehovah’s Witnesses: True Christianity or Christian Cult? | The True History and Practices of the Church of Scientology! | Yes, In the Beginning God Created the Heavens and the Earth! | "Looking Back to Day Six of Creation and the Garden of Eden" | The Fall of Man, the Curse of Sin, and the Promised Redeemer | The Account of Cain, Abel and Seth: the Sons of Adam and Eve | From Adam to Noah - Man’s Wickedness, Nephilim and the Flood | The LORD Told Noah and HIs Family to Go into the Ark | But God Remembered Noah & All the Wild Animals and Livestock | God’s Blessing, God’s Covenant with Noah, and Canaan’s Curse | "Genesis Chapter 10" - The Account of Shem, Ham and Japheth | The Tower of Babel & the Ancient Babylonian Mystery Religion | The Blessing of Abram & God’s Promised Land to His Offspring | Genesis Chapter 13 - "Abram Called on the Name of the LORD" | Genesis 14 - Abram Rescues Lot & Pays a Tithe to Melchizedek | Genesis 15: God’s Covenant with Abram Who Believed the LORD | Hagar Will Bear Abram a Son and the LORD Named Him Ishmael | The Covenant of Circumcision between El Shaddai and Abraham | The LORD Appeared to Abraham and Abraham Pleaded for Sodom | Genesis Chapter 19 - Sodom and Gomorrah Destroyed by Angels! | Genesis Chapter 20 - Abraham and Sarah Deceive Abimelech | Genesis Ch. 21 - Sarah Bore Isaac to Abraham in Her Old Age | Genesis Ch.22 - Abraham is Told to Sacrifice Isaac as a Burnt Offering | Sarah Dies so Abraham Purchases a Field & a Cave in Hebron | The Servant of Abraham Was Sent Back to Get a Wife for Isaac (Genesis 24) | Genesis 25 – Abraham Left Everything that He Owned to Isaac! | Genesis 26 - Isaac Settles in Gerar & He Deceives Abimelech! | Genesis 27 – Jacob Deceives Isaac and Steals Esau’s Blessing | Traveling to Get a Wife, Jacob Dreams of a Stairway to Heaven | Genesis 29: Jacob is Deceived by Laban so He Will Marry Leah | Genesis 30 - Jacob is Blessed with Many Children and Flocks! | Genesis 31 - Jacob Flees from Laban then Laban Pursues Jacob | Genesis 32 - Jacob Prepares for Esau; then Wrestles with God | Genesis 33 - After Twenty Years, Jacob Reconciles with Esau | Simeon and Levi, Dinah’s Brothers, take Vengeance on Shechem | Genesis 35 - Jacob Builds an Altar to God Almighty at Bethel | Rejected by His Own Brothers, Joseph is a Type of the Messiah | Judah, his Daughter-in-law Tamar, and the Levirate Marriage | Joseph and the Wife of Potiphar, Captain of Pharaoh’s Guard | Joseph Interprets the Dreams of Pharaoh’s Cupbearer and Baker | Genesis 41 - Pharaoh Sends for Joseph to Interpret His Dreams | Genesis 42 - Joseph’s Brothers Went Down to Egypt to Buy Grain | Genesis 43 & 44 - Joseph’s Brothers Bring Benjamin to Egypt | Genesis 45 - When Joseph Made Himself Known to His Brothers! | Genesis 46 - Jacob and the Sons of Israel Go Down to Egypt | Genesis 47 - Joseph’s Father and Brothers Now Dwell in Goshen | Genesis 48: Jacob Blesses Manasseh and Ephraim Joseph’s Sons | Genesis 49 - Jacob Calls for His Sons to Assemble Before Him | Genesis 50 - The Egyptians and Jacob’s Family Mourn for Jacob | Introduction to the Book of Daniel | Daniel, Hananiah, Mishael and Azariah are Captive in Babylon | Daniel Interprets Nebuchadnezzar’s Dream of a Dazzling Statue | King Nebuchadnezzar Made an Image of Gold Sixty Cubits High! | Daniel Chapter 4 - King Nebuchadnezzar Has a Fearful Dream! | Daniel 5 - King Belshazzar Quakes at the Writing on the Wall | Daniel 6 - The Scheme of the Administrators and the Satraps | Daniel 7 - Daniel Had a Dream and Saw Visions of Four Beasts | Daniel 8 - Daniel Has a Vision of a Ram with Two Long Horns | Daniel 9 -The Desolation of Jerusalem Would Last Seventy Years | Daniel 10 - A Revelation Was Revealed to Daniel in a Vision | Daniel 11 - The Kings of the North and South and the Antichrist | Daniel 12-Michael Will Arise and There Will Be Great Distress | An Introduction to the Book of Judges when Israel had no King | After Joshua Died, Israelites Fight the Remaining Canaanites | Judges 2 - The Israelites Disobeyed the Angel of the LORD! | Judges Chapter 3 - The Israelites Lived Among the Canaanites | Judges Chapter 4 - Deborah led Israel now that Ehud was Dead | The Israelites were given into the Hands of the Midianites! | Judges 7 - The LORD said to Gideon, "You Have too Many Men." | Judges Chapter 8 - Gideon Captures the Two Kings of Midian | Judges Chapter 9 - Abimelech Murdered His Seventy Brothers! | Judges Chapter 10 and Chapter 11 - Tola, Jair and Jephthah | Judges Chapter 13 - The Birth of Samson Who was a Nazarite | Judges Chapter 14 - Samson Wants a Philistine Woman as a Wife | Judges Chapter 15 - Samson Takes Vengeance on the Philistines | Judges Chapter 16 - The Secret of Samson’s Strength Revealed | Judges Chapter 17 - Micah from the Hill Country of Ephraim | Judges Chapter 18 - In Those Days the Danites Had No King | Hebrews Chapter 1 - These Days He Has Spoken to Us by His Son | Hebrews Chapter 2 - How Shall We Ignore so Great a Salvation? | Hebrews Chapter 3 - Jesus is Worthy of Greater Honor than Moses | --Type Title Here-- | Hebrews Chapter 5 - A High Priest in the Order of Melchizedek | Hebrews Chapter 6 -The Things that Have to Do with Salvation | Hebrews Ch.7 - Jesus is a Priest in the Order of Melchizedek | Hebrews Chapter 8 - Jesus the High Priest of the New Covenant | Hebrews Chapter 9 - Regulations for Worship in the Tabernacle | Hebrews Chapter 10 - Christ’s Ultimate Sacrifice Once for All | Hebrews Chapter 11 - Great Men and Women Who Lived By Faith! Within the tabernacle’s first room (the Holy Place) was the golden lampstand. Symbolizing light from God, the intricately patterned lampstand was to give light continually, fueled by clear olive oil (Exodus 27:20). Revelation 1:12-20 indicates that the local churches were represented by golden lampstands. Jesus is the light of the world (John 8:12). Christians are to be a light to the world, also (Matthew 5:14). The table of showbread is a symbol of God’s omnipresence and provision. The table held the twelve loaves of bread that were a reminder that the tribes were constantly in the presence of God and that God saw all that they did (Leviticus 24:5-9). The bread also reminded the people that God fed His people. God provides what we need (Matthew 6:25-34). We as Christians are daily in God’s presence. We are to “feed on” God’s truth (Matthew 4:4). Jesus is the Bread of Life (John 6:35). The golden altar was actually in the Holy Place where it stood before the inner veil (curtain) separating the Holy Place from the Holy of Holies. Hebrews 10:19-20 teaches that this veil represents Christ’s body which was given for us on the cross. When He offered up His spirit, the veil in the temple was torn from top to bottom, thus allowing anyone to come at any time into God’s presence (Matthew 27:50-51). Aaron, the High Priest, was instructed to burn incense on the altar each morning and at twilight, every day, as a regular offering to the LORD (Exodus 30:7–8). The altar of incense can be seen as a symbol of the prayers of God’s people. Our prayers ascend to God as the smoke of the incense ascended in the sanctuary. The fact that the incense was always burning means that we should always pray (Luke 18:1; 1 Thessalonians 5:17). The altar of incense can also be seen as a picture of the intercession of Christ. Just as the altar of sacrifice in the courtyard was a type of Christ’s death on our behalf, the altar of incense in the Holy Place was a type of Christ’s mediation on our behalf—Christ’s work on earth and in heaven. Only once a year, on the Day of Atonement, would the high priest enter into the Most Holy Place through the inner veil. The high priest was first to make atonement on the horns of the golden altar of incense before entering the Holy of Holies. The writer of Hebrews places the altar of incense behind the second curtain because on the important significance of the Day of Atonement, the most solemn day on the Hebrew ceremonial calendar. It is when the smoke from the incense would shield the High Priest from the overwhelming divine presence – the Shekinah glory of God. The Day of Atonement is the only day each year on the Hebrew calendar when the high priest offers up sacrifices for the corporate national sins of Israel including wickedness and rebellion. A symbol of God’s law and authority, the ark was made of wood covered with gold. The ark was the throne of God where His glory rested above the Mercy Seat (top), a symbol of His loving kindness and compassion. The sacrificed blood was sprinkled on the ark to cover the sins of the people. The phrase “Mercy Seat” also means “propitiation.” Propitiation means the turning away of wrath by an offering. In relation to salvation, propitiation means placating or satisfying the wrath of God by the atoning sacrifice of Christ. Jesus is the propitiation for us today (Romans 3:25; I John 2:2.) His blood was shed to cleanse our sins. We come to God through Him and offer our spiritual sacrifices (I Peter 2:5,9). The stone tablets of the covenant (10 Commandments) served as a reminder of mankind’s disobedience to Gods commandments. Since no one is able to measure up to God’s holiness in his own efforts, the law pointed to the need for a savior. A golden pot of manna was a reminder of ancient Israel’s rejection of Gods provision. The budded rod of Aaron was a reminder of how the people questioned God’s appointed leadership. Numbers 17:1-13 can be summarized as follows: The Israelites were constantly grumbling against Moses. God said, “Moses, get me twelve staffs, one from each tribe. The staff that sprouts belongs to the man I have chosen” Aaron’s rod was the one that budded. The high priest could not go within the veil, because he was not perfect. He had to be sprinkled with blood, and that made him ceremonially acceptable to stand before the divine presence. But when next year came around he was not fit to go within the veil till blood was sprinkled on him again. And the next year, though he was always a consecrated man set apart by God to the office of high priest, he was not a perfect man. He had to be sprinkled with blood again. And so, year after year, the high priest before he went within the veil, first needed to make atonement by the sprinkling of blood for his own sins and then for the nation in order that he might obtain access to God. There are two types of unintentional sins. The first type is committed in ignorance. This occurs when there is any disobedience to a specific Biblical command because the offender was unaware of the command. The second type is unintentional known sin. This involves an unplanned or unintended disobedience to a biblical command which the offender knew. He accidentally did evil. Leviticus 4:1-12 and Numbers 15:22-29 refer to unintentional sin in general. On the other hand, presumptuous or willful sins are deliberate known sins that occur when a person who knows God’s revealed will written in the Bible, yet chooses to disobey by doing what is prohibited or not doing what is commanded. The first tabernacle was still functioning in a symbolic way since the second temple was still in use when the epistle (letter) to the Hebrew believers in Christ was written. The great weakness of the Old Covenant was that it dealt with external regulations. The worshiper who offered the proper sacrifices, washed himself ceremonially upon required occasions, observed the regulations as to meats and drinks was accepted into the commonwealth of God during that period. But none of those external ordinances did anything at all to cleanse the consciences of sinners. The blood of bulls and goats, the sprinkling of altars, the ashes of a red heifer, the burning of incense, the washings, etc., none of those things made the slightest change in people's hearts. The earthly tabernacle was built by human hands and was based upon the pattern of the preexisting perfect heavenly tabernacle. After Moses received the Torah by the hand of God, his brother Aaron was ordained as High Priest. Aaron had four sons. His oldest sons, Nadab and Abihu, were struck dead for offering profane fire before the LORD. Nadab and Abihu had no sons of their own. Aaron's surviving sons, Eleazar and Ithamar, served as priests. They and their male descendants after them served as priests before the LORD from the time that Israel wandered in the wilderness until the time of King David. There were a total of twenty-four heads of families from the tribe of Levi during the days of King David's reign. The regulation of twenty-four courses of priests rotating to minister in the Tabernacle was established in the days when Solomon had the Temple constructed and continued to be observed until the Second Temple was destroyed by Rome in AD 70. The twenty-four courses of priests serving in the earthly Temple were patterned after the twenty-four angelic priests who minister in the heavenly sanctuary. Unlike the earthly high priest who entered into the Most Holy Place by the blood of sacrificed animals once a year over and over again, Jesus only had to enter once for all by his own blood. He was then able to obtain eternal redemption for those who by faith would place their trust in His work of redemption on the cross. The blood of goats and bulls and the ashes of a ritually pure red heifer were necessary to purify the furnishings in the temple. They were also used to purify people who may have become unclean by touching a dead body for example. But these rituals only sanctified the people outwardly. People's consciences could not be cleansed by doing the works of the law. The blood of bulls and goats could not take away sin. A good conscience becomes reality when a person receives the gospel of Christ through faith and repentance. He or she testifies of the inward work of grace by baptism, and rising to walk in newness of life. A mediator is one who intervenes between two people and serves as an intermediate and conduit of communication between these two contracting parties. Christ is the mediator of the New Covenant. Christ is the one and only mediator between God and man (1Timothy 2:5). He makes reconciliation between God and man by his all-perfect atoning sacrifice. Such a mediator must be at once divine and human. Being divine, Christ’s obedience and his sufferings possess infinite worth. By his infinite wisdom, knowledge, and power, he can perfectly direct all things in the kingdoms of providence and grace which are committed to his hands. In his humanity, He is the perfect representative of mankind, and was capable of rendering complete obedience to the law and satisfying the requirement of justice. In his glorified humanity He reigns as the head of a glorified Church (Colossians 1:18). While a person is still alive, they can alter their last will and testament. Only after they die, are the provisions of the will put into effect. Christ’s substitutionary death on the cross and the shedding of His blood both ratified the New Covenant as well as put it into effect. In the Old Testament the Hebrew word “berith” is always translated as covenant. Berith is derived from a root which means “to cut,” and hence a covenant is a “cutting,” with reference to the cutting or dividing of animals into two parts, and the contracting parties passing between them, in making a covenant. A series of events are set into motion when two people decide they want to “cut the covenant.” It is referred to as the blood covenant ceremony and is considered a most serious and solemn event. The walk of blood: Each participant walks a path in the shape of a figure “8” between the halves of the slain animal, then stops in the middle in the midst of the pool of blood to pronounce the blessings and the curses of the covenant. The curses would be brought to bear upon the one who broke the blood covenant. It basically said, “The one who breaks this covenant will die just like this animal has died.” A pledge was also made that said, “Just as this animal gave its life so I will give my life for you if necessary." The LORD cut a covenant with Abram. According to the account found in the first two verses of Genesis chapter 12, Abram had been promised that the LORD would make him into a great nation and would bless him if Abram would leave his country, his people and his father's household and go to the land that the LORD would show him. Abram had made the arduous and dangerous thousand mile journey. First Abram transported his family, servants, goods, and animals on a hard trek from the Chaldean city of Ur to Haran, and then from Haran to Canaan. Abram had believed God’s promise that he would have an heir from his own body and numerous offspring. Abram was declared righteous because of his faith. Abram asked for a sign that he would possess the Land of Canaan, but instead the LORD ratified His promise by entering into a covenantal relationship with him. Both the Abrahamic Covenant and the Mosaic Covenant involved the death of ceremonially clean animals and the shedding of their blood. The earthly tabernacle and the later two temples in Jerusalem were patterned after the heavenly sanctuary. The man-made tabernacle was declared ceremonially clean by purification with the blood of animals. As the heavenly tabernacle is far superior to the earthly copy, so is the blood of Christ far superior to the blood of sacrificial animals. The hypostatic union is the term used to describe how God the Son, Jesus Christ, took on a human nature, yet remained fully God at the same time. Jesus always had been God (John 8:58, 10:30), but at the incarnation Jesus became a human being (John 1:14). The addition of the human nature to the divine nature is Jesus, the God-man. This is the hypostatic union, Jesus Christ, one Person, fully God and fully man. Since Jesus is fully God and fully man, His blood has infinite worth. Unlike the earthly high priests who had to enter the Most Holy Place year after year with the blood of animals, Jesus only had to be crucified once to shed his blood to do away with sin. During the “First Advent”, when John was baptizing in the Jordan, he declared that Jesus was the Lamb of God who takes away the sin of the world (John 1:29). Jesus rode into Jerusalem lowly on a donkey’s colt. Five days later, Jesus fulfilled the prophecies of Isaiah 53 as the “Suffering Servant” who would bear the sins of His people by His death on the cross. Note that this Bible verse does not say, “Redeemer” but “redemption.” He is coming back to redeem our mortal, corruptible bodies. Both those saints who are alive at His coming as well as those who are asleep in Christ will receive their glorified bodies to meet Him in the air. He came the first time as a sacrificial lamb, but He is returning as, “The Lion of the Tribe of Judah.” When Jesus returns to the earth, the King of Kings and Lord of lords will be riding a “war horse.” He will be king over all the earth! Festivals of the LORD reveal Bible Prophecy about End Times.